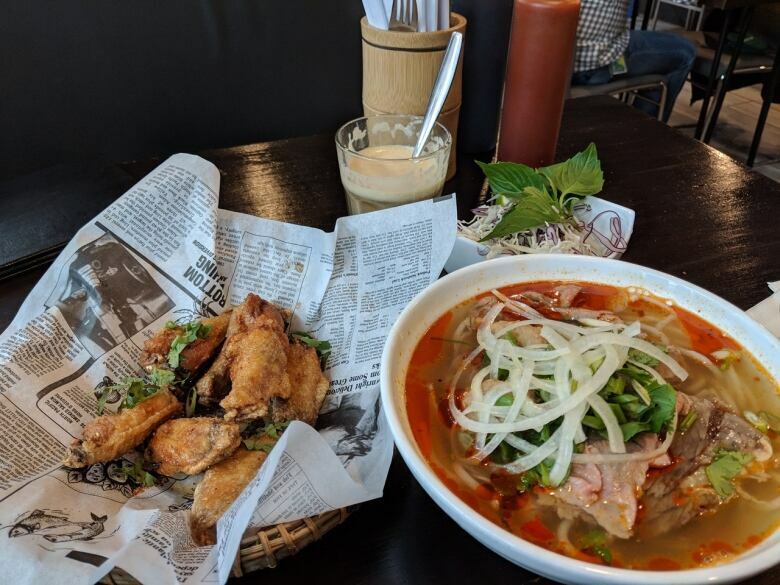 XO Bistro & Bar delicious Vietnamese fare in the heart of the Ice District, says Edmonton AM's food reviewer Twyla Campbell. Thuy Dinh recently celebrated the second anniversary of her restaurant, XO Bistro & Bar, on 103rd Street in Edmonton's Ice District. I visited the restaurant shortly after it opened in 2017 but truth be told, my experience was so dull, I was in no rush to return. In fact, it was only after tasting the double-trouble spring rolls that Dinh presented at Downtown Dining Week's opening night at the Art Gallery of Alberta that I decided a second visit was warranted. That visit went so well, I returned for a third visit the very next day. The name, XO, has nothing to do with the dried seafood condiment that originated in Hong Kong, Thuy told me, and everything to do with how fond the Vietnamese are of Hennessy XO cognac. One month ago, I was eating my way through Vietnam, from Hanoi in the north to Ho Chi Minh City in the south, and not once did I partake of that fine beverage. I did, however, indulge in variations of Vietnam's other liquid love, coffee — iced coffee with sweetened condensed milk, iced coconut coffee, and egg coffee, a strong coffee topped with a luxurious concoction of egg yolks whipped with vanilla-infused sugar and sweetened condensed milk. How thrilled I was to see it on XO Bistro's menu. This, I thought, bode well for the restaurant. 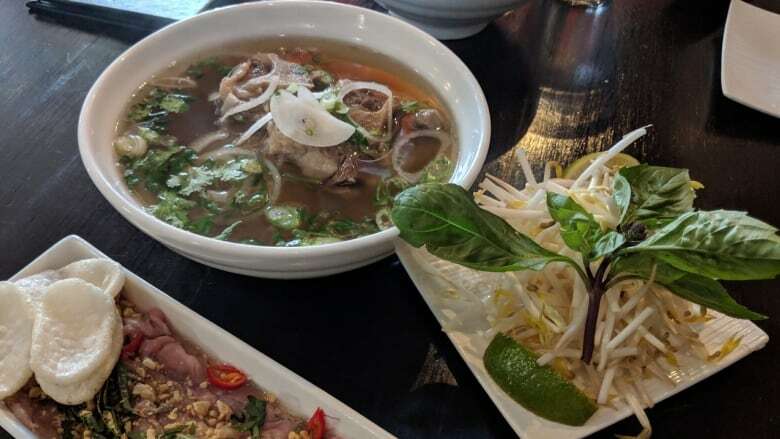 What also got my attention was the bun bo Hue, a sweet and spicy rice noodle soup that originated in Hue, home to the royal court and former capital of Vietnam. I've had this soup in other Edmonton restaurants, but the broth has often left me wanting. At XO, slices of tender flank, rare beef and flavourful, delicate pork balls top spaghetti-like rice noodles that swim in a complex, beef-based broth enhanced and made red by paprika oil, and richly scented with lemongrass, onions and other aromatics. The oxtail pho is no slouch, either. Two hearty, succulent pieces of oxtail perch upon a mound of flat rice noodles in a beef broth enriched with star anise and warm spices. It needs no doctoring save for a squirt from the lime and a scattering of basil that comes with each bowl. A person could go to XO just for appies and drinks, I suppose — after all, they do call themselves a "bistro and bar." If that's the case, I recommend the chicken wings with sweet and spicy fish sauce, or the lime and bird's eye chili-accented Viet beef carpaccio to go with any one of the "Asian inspired cocktails." I'm hoping the wings from now on, tasty as they were, will be cooked to order instead of deep-fried and reheated or flash-fried just before serving — a time-saving practice used throughout night markets and with street vendors in Vietnam, but not one I'd think necessary here. It seems there is no bad choice at XO Bistro, at least from the list of dishes I tried. I've made plans for a fourth visit, just to make sure. XO Bistro & Bar is located at 10236 103rd St.